Sometimes it is hard to know where to get ideas to help your child with their reading. Luckily there are many resources and books to give you ideas about how to do this. 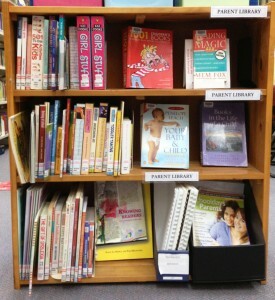 We have many books in the Parent Library that give ideas and support for promoting reading. One of these is Mem Fox’s Reading Magic. Please let us know if you would like to become a member of the Parent Library and borrow books from the Parent Library. The following websites have great advice for parents. Recently recommended by James Nelson (Director of Student Development) is the FOR THE TEACHERS site. 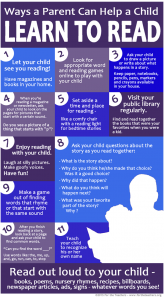 This excellent graphic (also downloadable as a PDF) suggests WAYS A PARENT CAN HELP A CHILD WITH READING (select this link for their blog post). Here you will find a link to a Early Reader and Older Reader version of this resource (scroll to the bottom of the post). 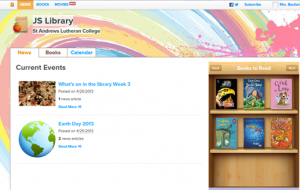 The image is reproduced with permission from For the Teacher blog.